Consructor. Creates the controller object. Destructor. Destroys the controller object. Close a controller. Closes the controller. True if the controller was closed successfully, or false if the controller was already closed, or an error occurred. 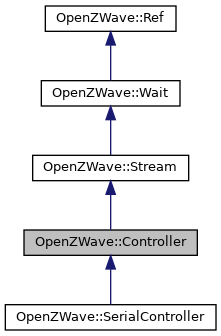 Implemented in OpenZWave::SerialController, OpenZWave::HidController, and OpenZWave::HidController. Open a controller. Attempts to open a controller and initialize it with the specified paramters. _controllerName The name of the port to open. For example, ttyS1 on Linux, or \. in Windows. 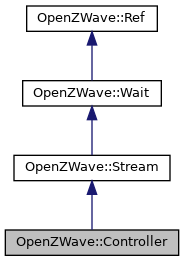 Queues a set of Z-Wave messages in the correct order needed to initialize the Controller implementation. Pointer to the driver object that will handle the messages. Read from a controller. Attempts to read data from an open controller. _buffer Pointer to a block of memory large enough to hold the requested data. _length Length in bytes of the data to be read. Write to a controller. Attempts to write data to an open controller.